Hi, I’m so excited to share another layout with everyone here. I haven’t done a one-photo layout in a while, so I decided to use this photo from past Mother’s Day. Although I love this photo, I’m not too crazy about the bushes and trees in the background. But I decided I would work with the photo with repetitive stamping of one of the stems from the Tulip stamp set using the Frayed Leaf and Forest Glades Crisp Inks. Also using the Frayed Leaf Crisp Ink and water, I created a smooshing effect on my background before I started my stamping. Then I added some of the sentiment stamps from the Tulip set to complete my background. I used watercolor paper since I used so much water. Next, I trimmed it down to 8.25×10.75 to adhere to the Navy 8.5 x 11 cardstock. 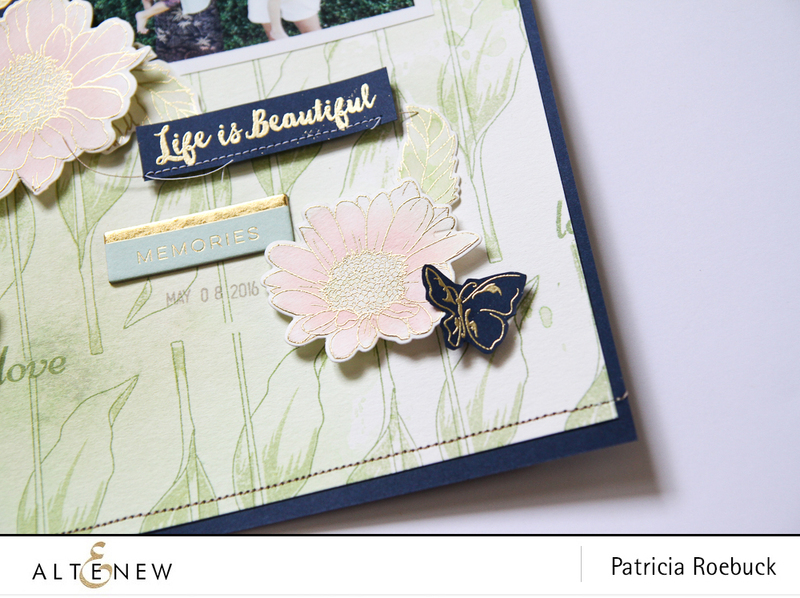 I used the same Navy cardstock to gold emboss the Painted Butterflies. I love the contrast the navy cardstock creates against the pale green background. And the gold is just so elegant against it. 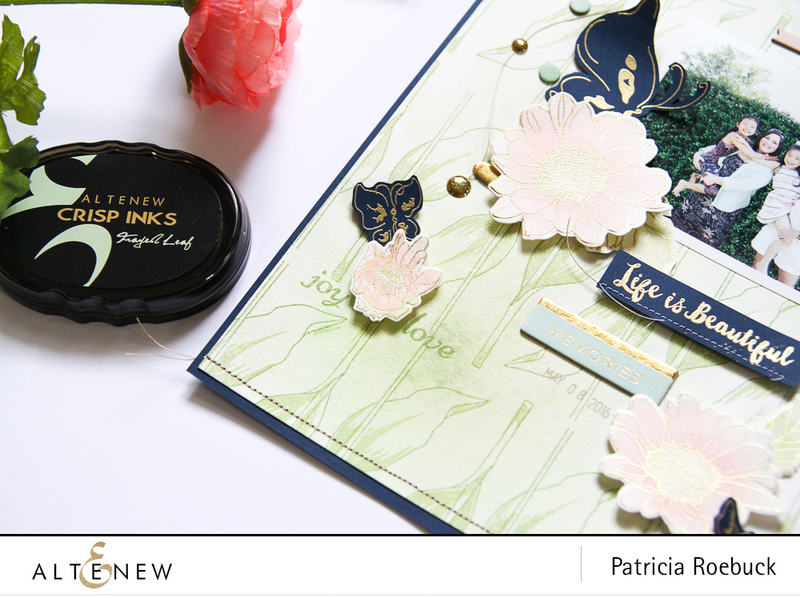 Next, I gold embossed the Spring Daisy flowers and leaves and watercolored them with Blush and Peach Perfect Crisp Inks. Then used the matching dies to cut those out. With my stamped and inked background and the stamped images, I didn’t need to add any pattern paper. 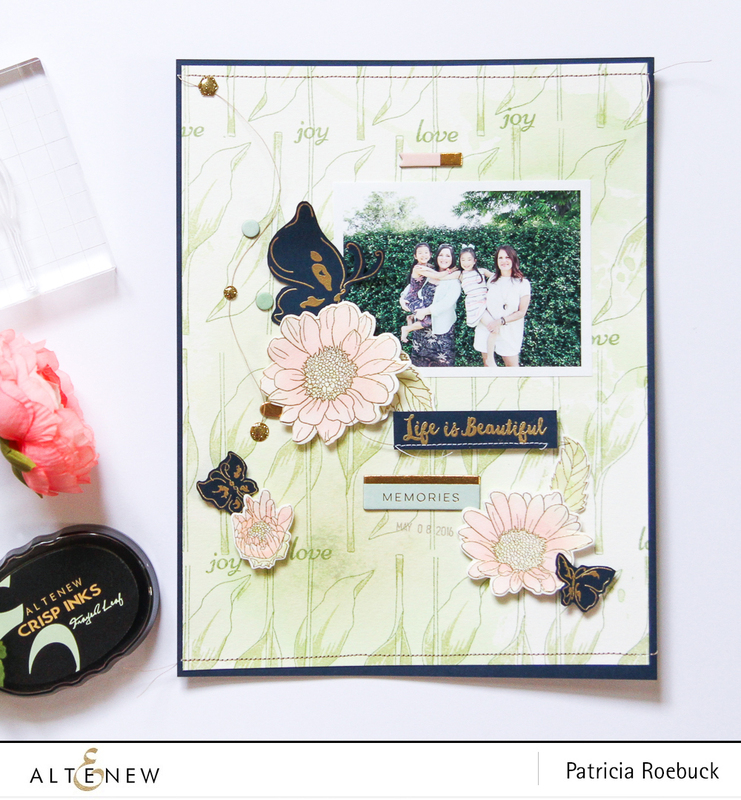 The stamping created enough texture and color! I then finished off my layout with some straight stitching at the top and bottom, enamel shapes and chipboard pieces. You can watch the HD video here or below for how the layout came together. Thank you for letting me share! Patricia this is stunning! Your stamping reminds me that those tulips are on my list!!! You are very sweet, thank you, Michelle! Hope you get the stamp set! 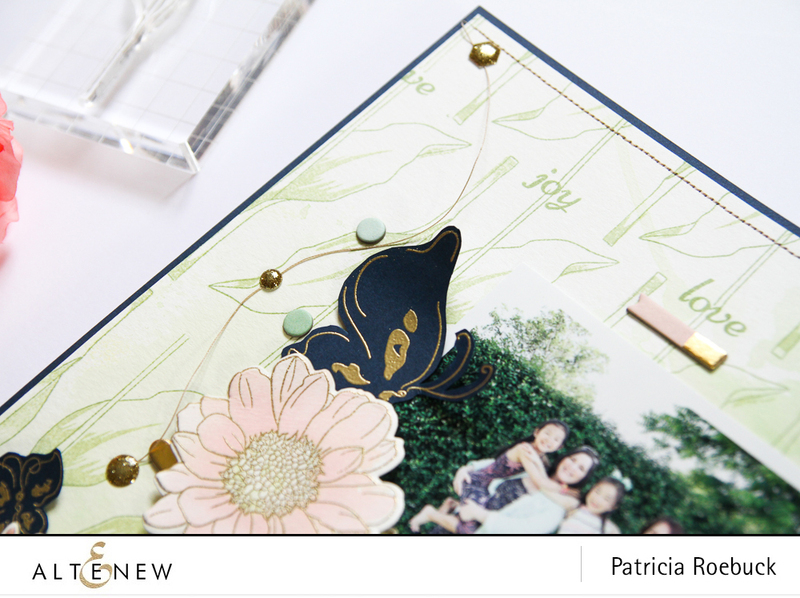 Patricia, this is one lovely and beautiful layout. Love love love your design! Helen, you are so sweet to me, thank you so much!